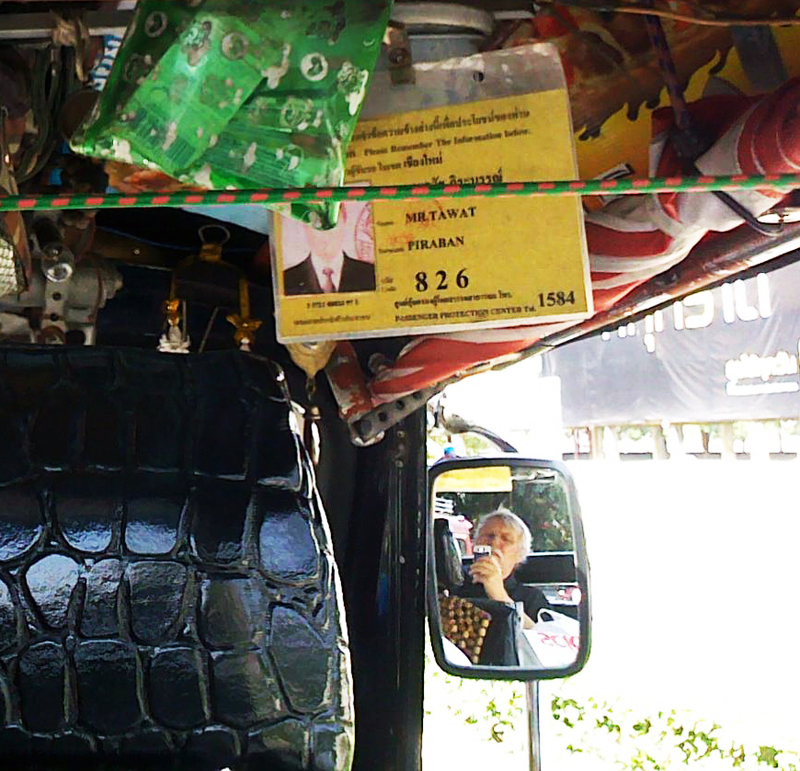 POSTCARD#63: Chiang Mai: Going home in a tuk-tuk with M sitting beside me, small body-mass pressed against my side. The urgency of speed, kinda scary, canvas roof, no walls and immense sound of 2-stroke engine fills our space. Impossible to hear what she’s saying, M indicates that she wants to borrow my phone. I pull it out of my pocket, hesitate. Is it okay to play with a slippery glass-like instrument like this in a speeding tuk-tuk? It might fly away into the great-rushing-past-outside world, anicca, necessity of mindfulness – she should hold it tight. Small face looks at me silently… don’t make a thing out of this Toong-Ting. I press it into her small hands. Hot, prehensile fingers grab, grasp and clasp the phone. Go to settings, clear away unwanted windows with the swipe of a tiny finger and launch multiplayer Minecraft. So fast! I’m kinda surprised she’s managing to get Internet, 3G signal reaching us here in a tuk-tuk racing through the streets of Chiang Mai – or maybe we’re in it, like a fish is in an ocean of water. Everything out-there passing by in a blur, feels like a totally crazy speed, why all this rush? I can see over the driver’s shoulder, through his windscreen and it’s like travelling through a wormhole in space-time; the actual here-and-now – everything outside of this is in a different reality. Everything on the ‘in’ side of it locked down tight, my arm around the slight presence of M, taking up such a small amount of the space on the seat, legs sticking out, and Minecraft’s digitally created landscapes of mountains and seascapes appear in the little window of the phone in her hands. She’s now in player-hosted servers with visiting players from all countries in the world. How do you say this Toong-Ting? She spells out: G-A-V-I-N. I tell her it’s a boy’s name, ‘Gavin’, probably English (who’s this Gavin guy, I wonder). I see name labels moving around the landscapes, Japanese and Italian names; Spanish, German, Norwegian – players I assume are about the same age as M. I see boy’s names and girl’s names, all here at this very moment – and, where is ‘here’? Good question: now here and nowhere, depends on the context… spatial and temporal qualities. Space and time are not separate, I read in a post recently [See note 2, below]. This is (always) where we are at. Looking down at the top of her head, hair combed from a parting in the middle, pulled out in two separate directions, woven into tight plaits on either side, and it’s as if she knows I’m looking at her: Remember this number Toong-Ting: 19122, she says. I consciously remember the number, repeating it to myself… In a moment she asks me what the number was. I tell her, 19122 and ask what it was for, by the way, but she doesn’t answer… having to have things explained to me by a 9 year-old girl who speaks English as a second language – must be a password or login name. Sad really, these days there’s not the dialogue there used to be, ‘I’ am not here, anatta, a suspended state, waiting for the next question. What’s this mean, Toong-Ting? M spells out: B-R-O-S and I tell her it’s a boy’s server, he’s American probably, he’s black and I think she knew the word ’bro’ already. Obviously interested in this and next thing she’s in with the BROS, their mountains and volcanic lava, burning fires. Then there’s a little wail – she gets disconnected. It feels to me like a catastrophe, but for M it’s no big deal, she changes to a different player-hosted server with new players – or maybe some of them are they same ones who just got here from the same sites we were all in earlier. And while that’s loading, a quick glance at the blur of what’s out there rushing by us, then she starts to sing a song from the movie: Frozen: ‘Let it go, let it go….’ I join her in the song. 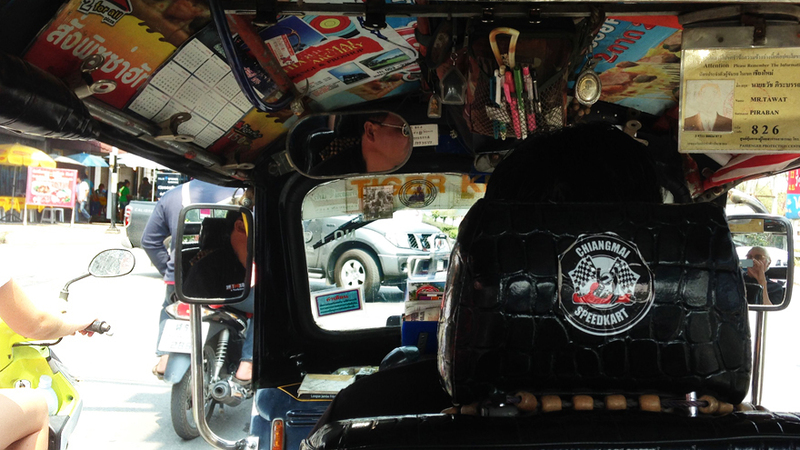 We sing together, Tuk-tuk driver laughing with his eyes in the rear-view mirror…. Nice post, so precisely observed in the midst of great pace. You weren’t by any chance Jack Kerouac in a previous life? Good post, love play on words: now here is nowhere. Thanks, I got the idea 2 years ago when I was searching for a domain name. Couldn’t find anything satisfactory to go with the ‘now here/nowhere’ part of it. Nowhere is meaningful in the context of ‘somewhere’, the idea of a constructed self, but it really says everything as it is: now-here. So I was looking for an opportunity to use it and that’s how this post came to be as it is. Scribbling domain names in a notebook to see how they look as one word without spaces, now here/nowhere, and that’s how I stumbled upon it. The Zen part is that it can’t be developed any further than this… maybe someone else can. It’s been used since I found it 2 years ago, I saw something that had it as an ending to a post about 3 weeks ago. In one of the emails from blogs I follow, maybe a reblog or something from somewhere else but cannot find it now. If anyone reading this has seen it, please let me know. I loved this post. Your relationship with M. is so touchingly written and obviously touchingly lived. I try to picture the tuk-tuk. Loved the Nisargadata quote, too. I remember getting all excited long ago reading David Hume, on how cause and effect is basically an illusion. He made it very complicated but explained why. Better just to say it exists only in the mind. When M was quite small she soon learned that every time I’d come to see her, her mum and everybody would switch to another language and our conversations would be merging from Thai to English to Thai all the time. So one day she just joined in! We are all trying to remember her first utterance – it came out as a complete statement, a miracle! Every day there are new words and observations, fascinating to see it develop. We are all attracted to her v much. About David Hume and causality, well… I’d need to study that in another lifetime – as you say, cause/effect exists only in the mind. When you look at the process, it seems as if it’s not there. In Buddhism, causality is applied as a tool for understanding and Nina Van Gorkom and others have written a lot about cittas, tiny particles of causality in the Abhidhamma teachings. Good to hear from you again and thanks for visiting. Thank you for the very intriguing reference. I am afraid Nina Van Gorkom and the Abhidhamma teachings will remain for another lifetime for me and seem far more complex than Hume’s philosophical writings on causality. I find Buddhism highly intellectual and on a far more complex plane than the teachings of Paramanhansa Yogananda that I am studying right now. They are challenging enough. Perhaps I am just too concrete in my thinking. Thanks so much for sending the link though. The tiny particles of causality do sound intriguing. I very much look forward to all your posts. Oh, dear Tiramit, so glad you got “Autobiography of a Yogi.” It is a great book and led me to follow him. He is an avatar and great Hindu saint. In later works he strove to reinterpret the bible in terms of Eastern religion. I know you are Buddhist and very steeped in Buddhist teachings which I find beyond my scope for this life. Yogananda is more a guru of the heart. Think I am going to put it on my reading list to reread. Hope you’ll enjoy reading this man of God! I suspect I am one of the few people who had not heard the song from “Frozen.” After reading your post, I found the song and listened. I wanted to hear what you and M were singing as your writing is so clear that I always am left with a picture of where you are until your next post, which reveals where you have been. As I said, I am so glad to have discovered your blog; again, thank you for referring to my post on space-time. Your writing is surreal, in the sense that it has a lovely varnish of universality on every detail. I don’t quite know how it is done, but the simplest way to say it is that I feel somehow that if I were ever in Chiang Mai, I would have a friend of a tuk tuk driver and a family nearby, careening through the city. Thanks for giving me an idea of how the writing is received. Maybe it’s influenced by the Buddha’s teaching on how conscious awareness works, data received through the six sense gates and how we all fundamentally ‘know’ and recognise this kind of experience of things. A bit more exotic in my case because life is like that here and it’s always a novelty. My niece M is a novelty too and there’s that motivation to be included. In a week or so we all go to Phuket for time at the beach, and the end of May I’ll be back in Delhi – a different world… always something to write about.